States, through their respective governments, have, generally, two methods of determining the law as regards the conduct of their citizens. One is to support the development of law through local customs, traditionally: the common law. "Age cannot whither an act of parliament, and at no time, so far as I am aware, has it been ever admitted in our jurisprudence that a statute might become inoperative through obsolescence." The more contemporary law-making systems defer to an elected body to control what is law, which publishes that law in documents called statutes. Issue laws exclusively by written-form through statutes is a feature of civil law systems. Most jurisdictions, such as England, Canada, Australia, India, New Zealand and the United States have hybrid systems which adopt the common law but from to time, specify the law by writing statutes in which event, the statute replaces any inconsistent statement of the common law. Civil law systems write out their law as a matter of course, and have done so since at least the time of the Greeks and Romans (see, for example, the Law Code of Gortys). This, say the civilists, reduces the potential for arbitrary statements or application of the law. The English tradition is to rely first on the common law, derived from the time-tested and unwritten customs of the various communities on the British isle: "If it ain't broke, why fix it.?" In the British tradition, statutes are resorted to only if a hard change is necessary to the common law. In the modern era, almost all jurisdictions rely heavily on written laws - statutes - to promote peace and order among their citizens. Even venerable England now has a complete set of statutes to supplement and, where they conflict, supersede any rule of the common law. The written laws of the Canadian Province of Newfoundland are in a multi-volume set of books called the Statutes of Newfoundland whereas the statutes of Australia are referred to as the Commonwealth of Australia Consolidated Acts. 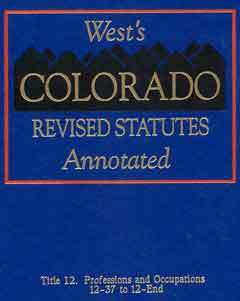 Occasionally, jurisdictions will publish an updated collection of their statutes, either directly or through contract with a private law publisher, as with the book pictured re Colorado. Allen, C., The Law in the Making (Oxford: Clarendon Press, 1927), page 283.